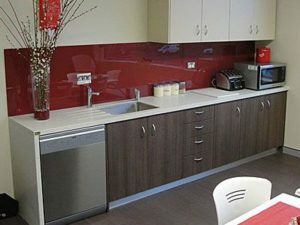 The kitchen or break room in your office is a high traffic and high volume area for your employees. It’s important to take at least 10 minutes each day to keep your companies kitchen, break room, or cafeteria in tip top shape. More people means more people to clean up after, so try making cleaning the kitchen a group effort. If each employee does their part, you’ll have the kitchen cleaned (and more importantly kept clean) in less time! Keeping a regular cleaning routine will help make the inevitable deep cleans significantly less overwhelming. Each company is different so be sure to set a kitchen routine based on the needs of your employees. Follow the links below to all of Bortek’s floor cleaning supplies as well as these simple tips to help keep your kitchen clean in just 10 minutes a day! This part is key to saving time! Prepare all the products and tools you will need for the tasks you choose to include in your 10 minute sweep. We suggest having an all-purpose cleaner, dishwashing supplies, paper towel, a disinfectant, garbage bags and cloths. 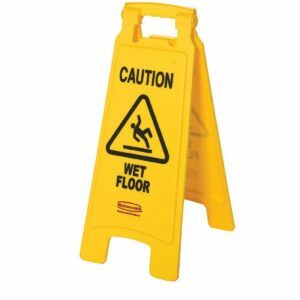 For floors, you will need a broom or vacuum, as well as floor cleaner and microfiber cloth. Each product will have a different purpose while cleaning, so it’s best to have everything you might need on hand. You’ll also want to have a trash can available for quick disposal and a basket or bag for any belongings from other areas in the home. Working in a clockwise direction, start by throwing out any garbage you find. If you notice the garbage filling up, change it! Don’t wait for someone else to do it. As you scan your surroundings, put any items that are out of place back where they belong. Ideally, everything in your kitchen should be organized and if not, it is worth taking time later on to get organized. Try not to get distracted by rearranging cabinets and drawers – it can be a task unto itself! For things that don’t belong in the kitchen, throw them into a bin or basket to put away afterwards. After everything’s been put away, it’s time to start working top to bottom. You’ll want to begin at the top to avoid having to go over any areas as you clean down. The first step is to spot clean. Areas like the front of cupboards, drawers or back splashes may not get a lot of use, but can get a number of fingerprints and a splash of grease around high traffic areas. Generally, this would be towards the bottom of cupboards, above or beside sink and stove areas, or around handles and knobs. To clean these areas, simply take a dampened cloth and wipe, then rinse with a clean cloth and buff dry. Once you’ve worked your way down, wipe the entirety of your counters and stove top. Grease doesn’t always play by the rules, so when it escapes your frying pan, seek some of Bortek’s all purpose cleaning solutions to help remove it from most kitchen surfaces. You can use your sink to dispose of any crumbs or debris to prevent it from falling to the floor or spreading onto cleaned surfaces. Be sure to rinse your cloth or sponge as needed so you’re always working with clean tools. When finished, dry the surface and your counter tops are clean enough to eat off. Just kidding, don’t do that, use a plate. Points of contact like handles, knobs, faucets, and light switches can let germs and other bacteria fester if not managed regularly. When using a disinfectant, you’ll want to let it sit for 5-10 minutes as directed before wiping off. Remember that a cleaner doesn’t disinfect, and a disinfectant doesn’t clean. You’ll also want to spray your counter tops to kill most bacteria and viruses. Be sure you give your sink its due attention by cleaning it regularly with dish soap. To do this, dampen a sponge, add a squirt of blue Dawn (I have it on demand in my kitchen’s soap pump), scrunch the sponge a few times to get it sudsy, and wipe down all surfaces in the sink. Get into the nooks and crannies around all handles, the faucet, seals around the sinks and drains. It’s easy and it works so well! You don’t necessarily have to break out the vacuum, but give your floors a good sweep to pick up any crumbs and debris that may have fallen to the floor. You can spot clean problem areas with a damp sponge or cloth for a squeaky clean finish. Easy enough? By following these simple tips everyday, you will see a world of difference and your employees will appreciate it. Create an account today with Customer Link to browse and order any of Bortek’s products online for one-stop shopping for all your cleaning needs.